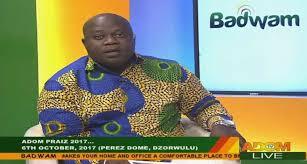 The host of Adom TV’s Badwam, Omanhene Kwabena Asante has described the public lecture held by the National Democratic Congress about the Economic Management Team town hall Meeting as bogus. According to the presenter, the first 3 speakers at the NDC lecture were simply serving the party’s interest and alsolooking out for positions if they come to power. “The 1st 3 speakers didn’t return to serve any purpose. wherever we have gotten to us a country, we will not tolerate such ‘keysoap concert party’. We have very serious problems and also the very little platform that we’ve got here we will not need that once more. the first 3 speakers were bogus. The NPP and Ghanaians ought to hear John Jinapor, he has raised pertinent problems. We are not joking and my expectation from particularly their Almighty Adongo wasn’t this creche lecture. John Jinapor was able to expose certain defect within the presentation of state on energy. Let’s move this country beyond this kind of pettiness and partisanship”, Omanhene stated. The Economic Management Team under the leadership of vice president Dr Mahumadu Bawumia held a lecture to handle the country’s economic challenges. According to the vice president, the economy is performing better than previous governments which there are credible data to support his claim. However, the NDC is of the view that Bawumia’s lecture is full of dishonest facts and patent misstatement laced with populist rhetoric.